CardiPro® offers a side effect free management of raised serum cholesterol and triglycerides and also helps to improve cardiac functions. CardiPro inhibits HMG- CoA reductase enzyme like atorvastatin, leading to significant reduction in Total Cholesterol and LDL-Cholesterol in the serum by decrease in LDL synthesis and absorption of cholesterol from the intestine. CardiPro also reduces the level of Total Fats, Triglycerides and VLDL-Cholesterol in the blood by stimulation of lipoprotein lipase activity leading to increase in VLDL hydrolysis and clearance as well as decreased absorption of lipids from the intestine. CardiPro has a unique feature that it increases the level of HDL-Cholesterol in the serum by stimulation of lipoprotein lipase activity and increase in apo-AI and apo-AII synthesis and integral lipoproteins of HDL-Cholesterol. CardiPro with its peripheral and coronary vasodilatory actions and improvement in capillary micro-circulation also helps to reduce the load on the heart and improves effort tolerance. Sustained anti-oxidant action of CardiPro helps to maintain the level of glutathione and peroxidase and prevents the damaging effects of oxidized-LDL on aortic smooth muscles and restores expression of stress-proteins (Hemeoxygenase-II), reduces the number of micro-thrombi attaching to the intimal or medial surface of aorta and serves as potential anti-atherosclerotic. CardiPro reduces the heart and pulse rate and protects the heart by decreasing myocardial oxygen consumption in patients of proven Angina pectoris and Ischaemic Heart Disease. CardiPro modifies the CAD risk factors and helps in opening of collateral blood channels and end-arteries for improving circulation in ischaemic areas. CardiPro also prevents platelet aggregation, like aspirin, in CAD patients. Unlike chemical drugs which have adverse effect on libido, herbal CardiPro improves libido, as a side-benefit. 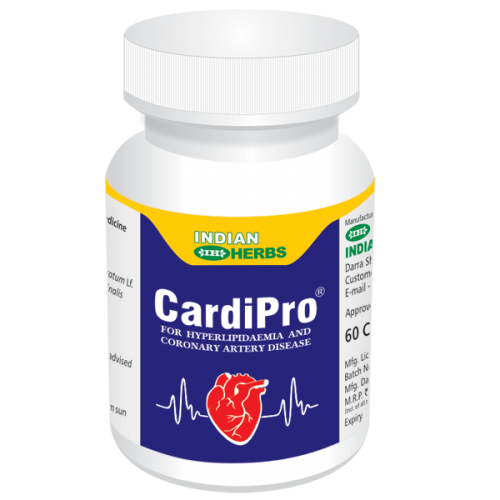 CardiPro is very useful for prevention of Cardio-vascular problems in people suffering from hypertension, high levels of triglycerides and cholesterol and those having a family history of cardiac problems, diabetes, obesity, smoking and living a stressful life. Administration of CardiPro before and after any heart surgery helps to prevent reperfusion injury, production of excess free radicals and to check systemic lipid peroxidation induced damage to heart tissue. · For effective control of hyperlipidaemia (both hyper-cholesterolaemia as well as hyper – triglyceridaemia) and dislipidaemia resulting from derangement of either exogenous (high lipid diet induced) or endogenous (insulting agent such as alcohol induced or hypothyroidism induced) pathway. · To increase HDL cholesterol and protect the myocardium against free readicals and oxidative damage caused by hypertension, diabetes mellitus and ischaemic heart disease. · To improve effort tolerance, reduce anginal episodes and nitrate usage, in patients of IHD and stable Angina pectoris. · For prevention of Ischaemic Heart Disease. · To hasten recovery after Myocardial Infarction and to prevent recurrence. · Cardiac Arrhythmia, Tachycardia & other cardiovascular disturbances. Adults: One capsule twice or thrice daily, preferably before meals.